Known for its natural beauty, Latrobe City is situated in the centre of the Latrobe Valley in Gippsland. Comprising four major urban centres: Churchill, Moe/Newborough, Morwell and Traralgon, Latrobe is the fourth-largest city in regional Victoria by population. 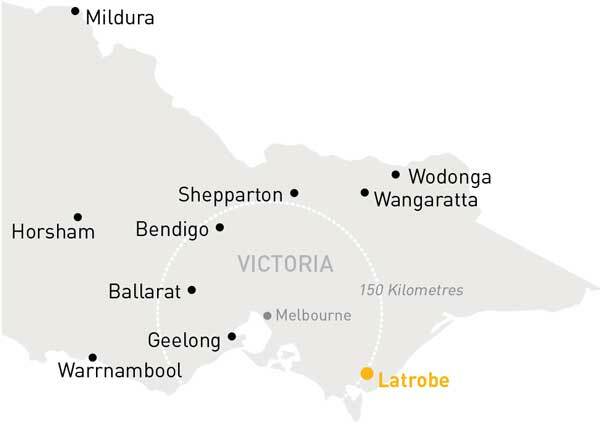 Located approximately 150km southeast of Melbourne, Latrobe City is a major service centre for the Gippsland region, particularly in the provision of retail, entertainment, education and health services. Latrobe City is a resource rich area with abundant forest, rich agricultural land and large brown coal and water resources. Latrobe City’s regional economy is underpinned by minerals, and the energy sector due to its large coal resource. Latrobe’s four major power generators produce approximately 90 per cent of Victoria’s electricity. The additional industries including timber processing, paper product manufacturing, agribusiness, post-secondary education, tourism and the provision of community services to the Gippsland region create a rich and diverse economy. Latrobe City’s cultural scene is spread right across the major townships with retail, fine dining, attractions, arts, music, theatre and sporting events. The region is a centre for hosting large national and international sporting events, in addition to a diverse and exciting range of cultural and community events. Latrobe City is known as the arts and culture hub of Gippsland with various entertainment facilities, theatres, cinema, art galleries and museums. Latrobe Regional Gallery in Morwell features eight exhibition spaces and a sculpture courtyard, showcasing permanent works and an annual program of state and national touring exhibitions. Other studios and galleries located across Latrobe City cater to a range of interests and artistic tastes. The Latrobe Performing Arts Centre is located in Traralgon and presents local, national and international productions, concerts and performances. Latrobe City’s central location makes it an ideal base to explore Gippsland’s inspiring nature-based and heritage attractions, including Tarra Bulga and Mt Baw Baw National Parks, Walhalla and rail trails. Electricity related industries are Latrobe City’s largest exporters. Latrobe’s role as a key hub for coal extraction, electricity generation and paper products manufacturing is reflected in its major export industries. The majority of Latrobe City’s industrial land is located south of the Princes Freeway in Morwell, containing the city’s largest available supply of industrial land ready for development. Latrobe City’s economy has diversified to include a range of industries including forestry and paper, manufacturing, agribusiness, retail, hospitality, aviation, health and education. There are around 4,246 businesses in the city and a workforce of approximately 28,600 people. Latrobe City is now home to Australia’s largest yoghurt manufacturing facility, the largest pulp and paper manufacturer in Australia, new Federation University and the only manufacturer of passenger aircraft in Australia. In the five-year period 2009-2014, there was strong employment growth in health care and social assistance; arts and recreation services; accommodation and food services; transport postal and warehousing and other services. Latrobe is located on the Princes Freeway and has connections to the State rail network, both V/Line and rail freight. The Latrobe Regional Airport is home to state emergency and medical response facilities, a commercial aviation manufacturing industry and provides private community transport and recreation and tourism services to the region. The RDV information portal has more detailed data and statistics on the Latrobe City region and regional Victoria more broadly.